This past weekend, as “pit bull” dog groups around the country celebrated National Pit Bull Awareness Day, our friends at Indy Pit Crew threw a huge festival in Indianapolis that brought in hundreds of dog lovers. Looking through the photos of the event, we couldn’t help but notice how the whole community was excited about celebrating “pit bull” dogs – even if they didn’t own a “pit bull” dog themselves! Branching out into the community and making connections with others, beyond “pit bull” dog lovers, is one of the key elements of successful “pit bull” dog advocacy. In order to make a positive impact for the dogs, from fighting BSL to educating the public, “pit bull” dog advocates need to be active members of their community…and not just when an issue affects “pit bull” dogs. By contributing to our communities, building bridges with other welfare groups, and partnering with local businesses, “pit bull” dog advocates can create the support and influence they need in order to succeed in their work. In other words, it’s time to think outside the “pit bull” dog box! So, what’s the secret to getting the support of the whole community behind your mission? We went straight to Cynthia Pearman, Board Member of Indy Pit Crew, to find out! Indy Pit Crew is an all volunteer based advocacy group for Pit Bull type dogs. Our mission is that through education and outreach, Indy Pit Crew combats dog-fighting, strives to eliminate Pit Bull overpopulation, encourages responsible ownership, while inspiring a better understanding of the American Pit Bull Terrier and all Pit Bull type dogs. 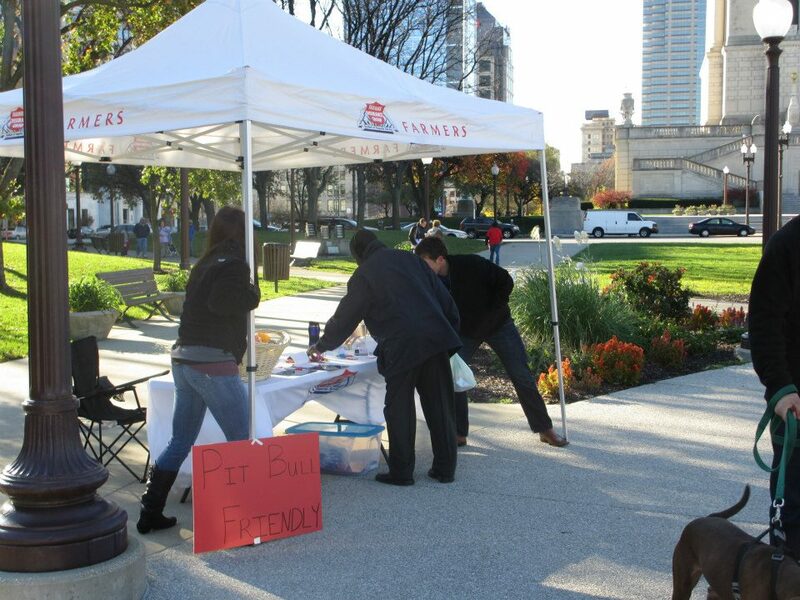 Indy Pit Crew holds monthly Community Pet Days which benefit all pets, not just the “pit bull” dogs. But aren’t you a pit bull group? What prompted IPC to serve all pets and their owners? Indy Pit Crew hosts Community Pet Days in May through October in community buildings around Indianapolis. Most of them are held at Boys and Girls clubs, which gives them another program for each of their clubs. Even though we are a “Pit Bull” group, over the years, we have received support from many groups and individuals in our community. As we have fought and won against BSL several times here in Indy, we have received support from everyone including breeders, city councilors, The Humane Society of Indianapolis, Indy Feral, Cat’s Haven, and many other animal welfare organizations who have very little to do with Pit Bulls, but who care about the fate of our pets. The Humane Society of Indianapolis formed an alliance of many animal welfare groups here in our city called The Indianapolis Animal Welfare Alliance. This alliance has proven to be a very strong and formidable voice for the animals. How does this inclusive approach have a positive impact on “pit bull” dogs? It’s the constant collaboration and forging of relationships that allows us to stand strong. It doesn’t matter if advocates care the most about Pit Bulls, feral cats, cats, or any other kind of dog. The relationships between humans are going to make the biggest difference in the lives of the animals and the people who love them. Serving the whole community of dog and cat owners only makes sense, as we all have a stake. We feel it’s important to serve our community with the same caring compassion that we have been shown. This year we focused on making this event a very positive experience where dog owners of all kinds can come out in support of Pit Bull dogs. Our goal every year is to make more friends and earn more support for Pit Bull dogs, if need be in the future. We had 500 people and 280 dogs pre-register for the festival and parade. In this year’s parade there were lots of Pit Bull dogs, plus little dogs, mutts, and every other kind of dog – as far as the eye could see! We’ve received so much positive feedback. I think people really love walking their dogs around our capital city, with the police stopping traffic for us and the dogs. And the costume contest is always so fun! 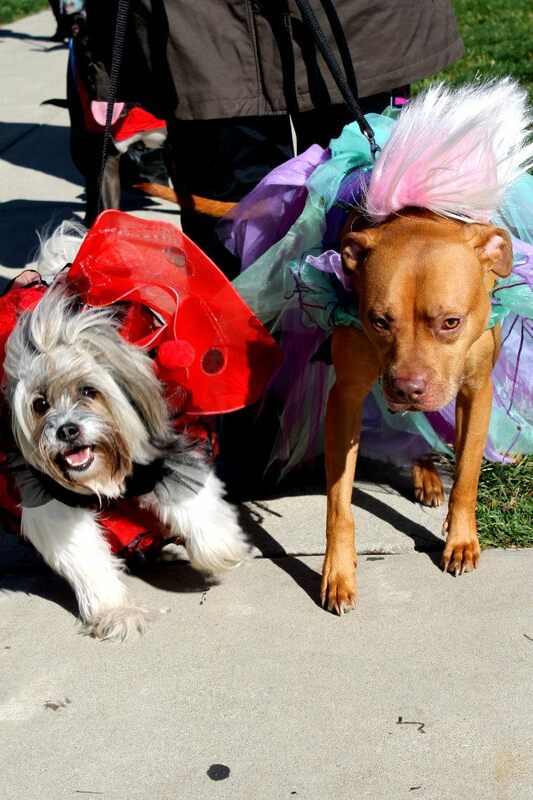 People come up with the best and most creative costumes for their dogs. You would be amazed at how much thought goes into creating some of the costumes. My favorite this year was Super Pit Bull. 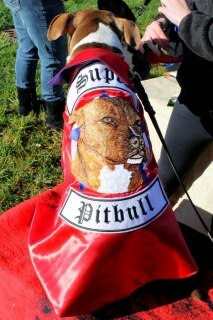 He had an embroidered cape with a Pit Bull and an awesome red mask. There really was something for every dog lover at the event. We even had a group called Pugs in the Kitchen come out and sell their delicious treats at the festival. State Farm and Farmer’s Insurance companies were both at your event. How did Indy Pit Crew connect with those businesses? So we are absolutely thrilled that both of these companies came out to support us. I think the key is to find the right agents, who also are community minded and want our business. 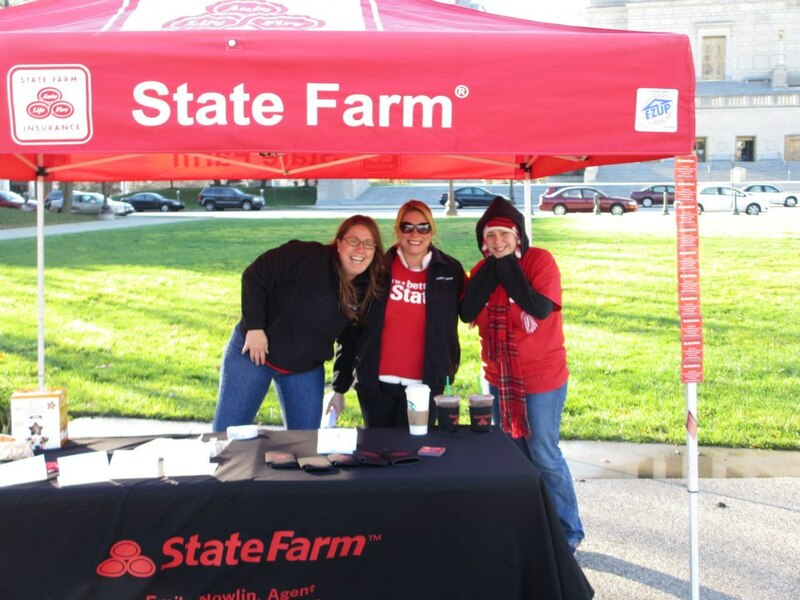 We have been contacting State Farm Insurance for several years to get someone out to the event. One of our volunteers really searched for the right agent until she found her. Not only did they pay for a top sponsorship, so that we could host the event, they had a booth where they handed out thoughtful dog-related items. We were so impressed. What’s equally as impressive is that Farmers Insurance actually contacted us. They wanted to be a part of the event. Farmers offered us a sponsorship as well. They wanted us to know that they do not discriminate. So it can be done! If you could share one lesson you’ve learned from your work with Indy Pit Crew with other “pit bull” dog advocates, what would it be? The biggest thing that I have learned is not to be afraid to evolve. Even Pit Bull advocates can get sucked into stereotypes. We must move past the negativity and the hysteria. We need to move towards a united community, who works together to make a difference for the animals, all of the animals. Thanks to Indy Pit Crew for talking to us! To see more photos of their fabulous Pit Bull Awareness Day event, please see their Facebook album. Next The Majority Project: First Look!